Take for example, the famous, but now fallen, Old Man of the Mountain on Cannon in New Hampshire, or his counterpart across the street on Eagle Cliff, the Old Lady of the Mountain, aka the Watcher, who still resides there today. All in all there are more than 15 spots around New England where you can view these rock faces and wonder if there are really rock men and women overseeing their mountains. 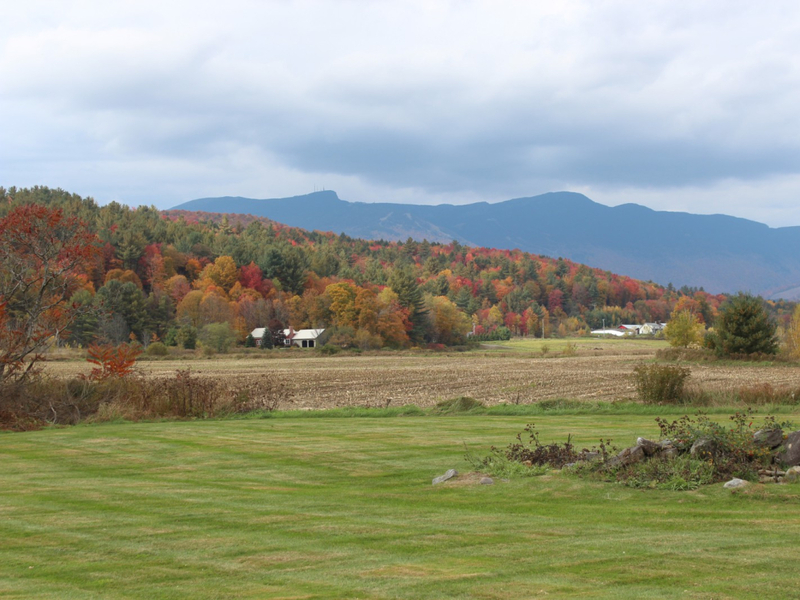 Mount Mansfield, located in the Mount Mansfield State Forest of Vermont, is just one of the more legendary ones. The ridgeline of Vermont’s highest peak is said to resemble the elongated face of a man looking up at the sky. When viewed from the east, his forehead, nose, mouth (upper and lower lips), chin, and even Adam’s apple can be clearly seen from left to right. In addition to being seen as a human profile, the Abenaki, a tribe native to Vermont, thought the ridgeline resembled that of a moose head and referred to it as Mose-o-de-be-Wadso or mountain with the head of a moose. 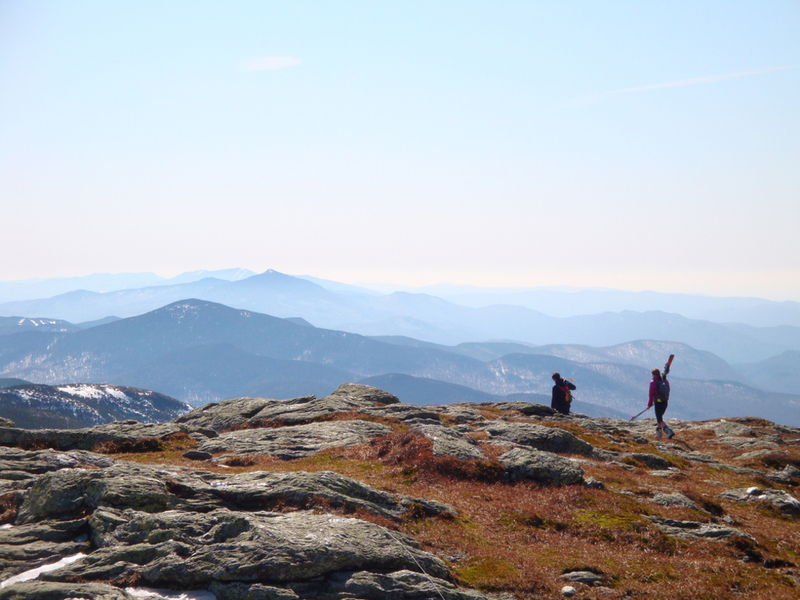 Regardless of man or moose, Mount Mansfield has one of the most recognizable and popular summits and ridgelines in all of Vermont. The mountain’s stunning views, hiking opportunities, skiing, and snowboarding are a huge draw throughout the entire year. Once a barren mountain too rocky for farming, this 4,393 footer has found its own road to success. Home to Stowe Mountain Resort, it’s one of the premier spots for winter sports in the Northeast. In fact, back in the day, the mountain was home to the very first American ski patrol founded in 1934. Then there's "The Stake," known by all locals as the best way to judge the amount of natural snow still on the ground. It's a 12-foot ruler located off the Toll Road about 3,900 feet up and is used as a legitimate snow measure in all the snow reports. And when it’s not snowing, Mansfield's got a pretty solid reputation as one of the best peaks in New England to hike. 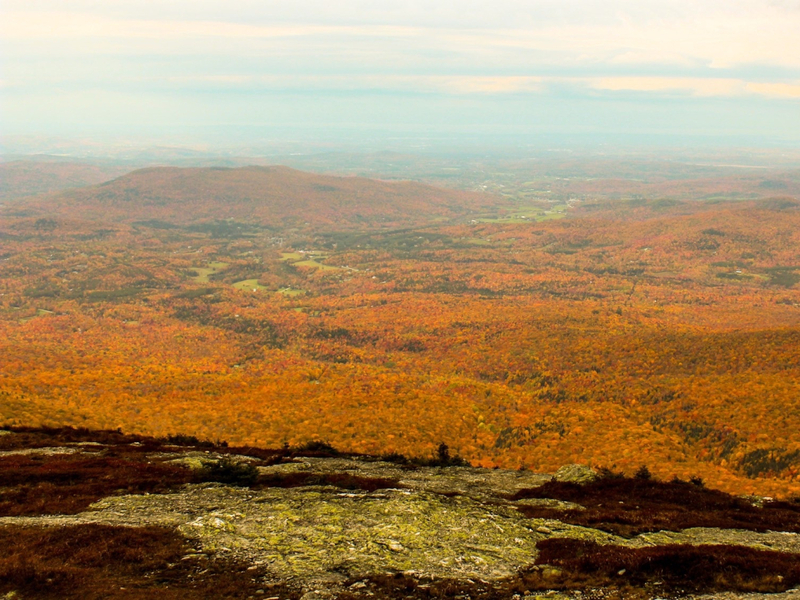 The 272-mile Long Trail that follows the spine of the Green Mountains from Massachusetts to Quebec, is one of Mansfield’s most popular ways to traverse the ridgeline and experience all the features it holds, including the mountain’s highest point atop the chin. The trail is maintained by members of the Green Mountain Club (GMC), a nonprofit organization in charge of the trail since 1910. The visitor’s center at the summit is run by GMC and is full of information about the mountain and the various hikes, including both the Long Trail and all the side trails leading to it. Hiking along the ridgeline provides amazing views of the miles upon miles of Vermont countryside awash in an ocean of color during the fall, blanketed in lush greens in the spring and summer, and snow-covered from November or so to April. From various points along the traverse, especially from the chin, you will see sweeping vistas of Lake Champlain and the Adirondacks, the Sterling and Worcester ranges, Mount Washington and the White Mountains, the Green Mountains, and, on a really clear day, you may even catch a glimpse of Mount Royal in Montreal. You can drive to the top of Mount Mansfield via the Auto Toll Road in Stowe, a 4.5-mile, beautiful drive up to the Long Trail and GMC visitor center. The slow drive up the steep, dirt road allows you foreshadowing glimpses of the views you will experience at the top. The Haselton Trail on the Stowe side of the mountain is a 2.1-mile hike up to the Nose. Starting under the gondola lift at Stowe Mountain Resort, the trail offers amazing views throughout as it constantly intersects with the open ski trails. However, when the new zipline to the right of the trail is open, this trail becomes slightly more raucous than restful. There are a handful of other trails on either side of the mountain for different approaches. 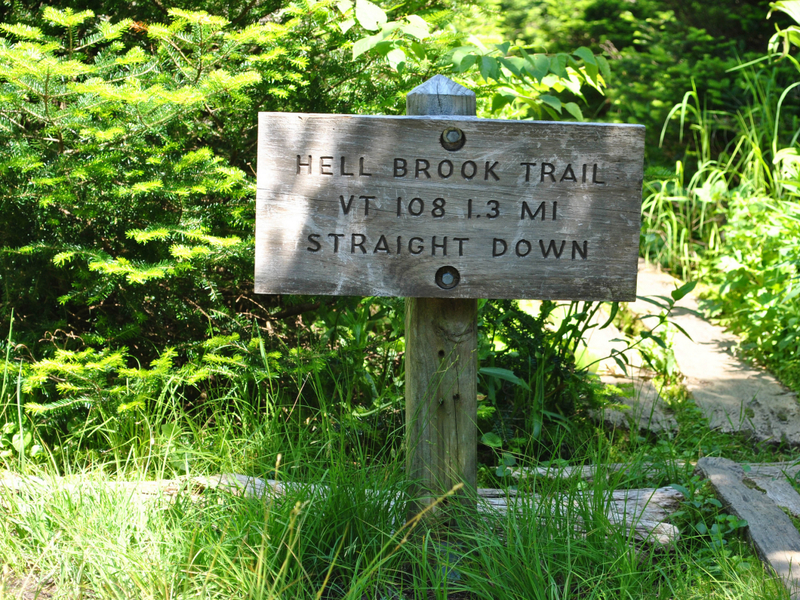 The Notch side is home to both the Long Trail, which can be hiked south to the Chin from Smugglers Notch, and Hell Brook, an incredibly steep trail not recommended for your descent. From Underhill, you can take the Butler Lodge Trail, which takes you past one of the GMC’s backcountry shelters, or the Frost Trail, which is a fun, partially rocky route with some technical sections. 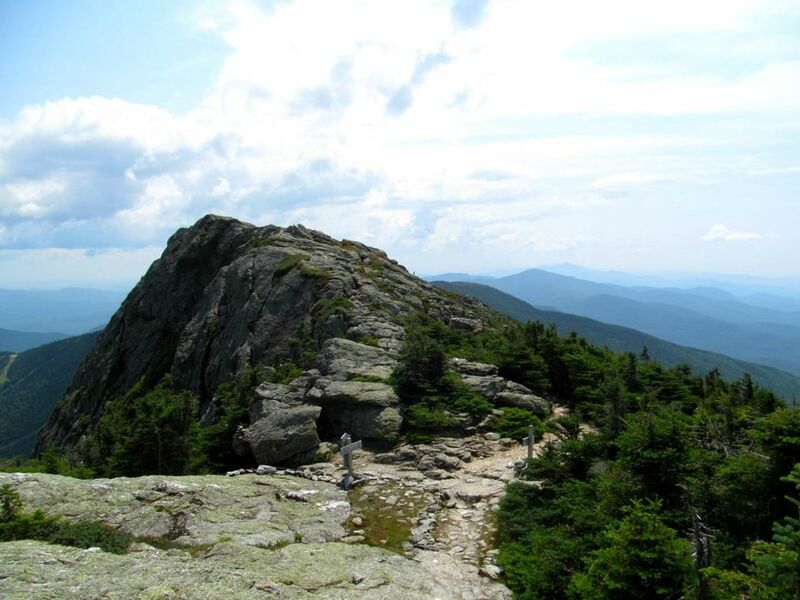 The GMC has a wealth of information on these hikes and more, so if you are interested in hiking or camping in Mount Mansfield State Forest, they are a great place to begin.